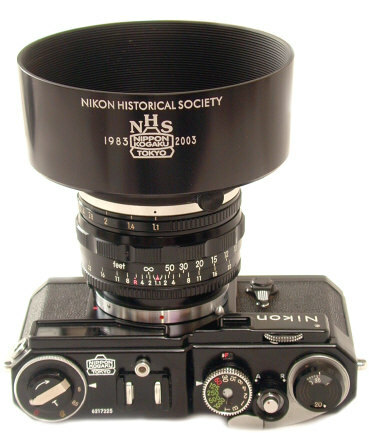 Production: 26 - Lower Production than the Original Nikkor 1.1 Shade combined with Much Better Design and Construction. SOLD OUT future collectible! January 2009 UPDATE: Tom was planning a 2nd production run, however it was never completed. Tom passed January 2017. Tom started with the dimensions of the original hood, and then of course redesigned it. 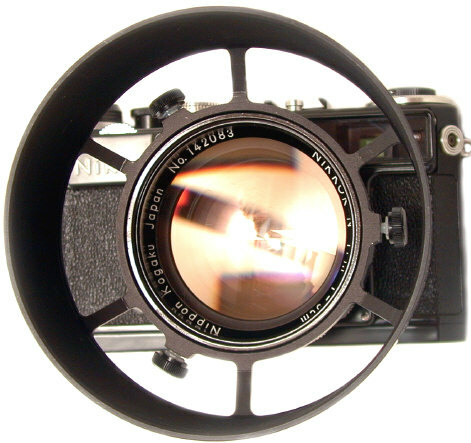 He is after all, an industrial designer by trade -- as well as an accomplished photojournalist. 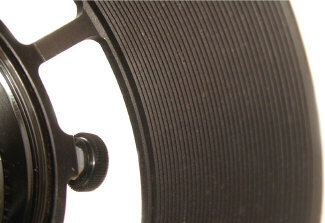 Instead of a fixed mount, he make a two piece mount so that the hood could be affixed to via a nylon tipped set screw. Instead of easily broken plastic or thin metal, Tom started with a SINGLE piece of aerospace aluminum alloy which is then machined on a precision CNC milling machine. 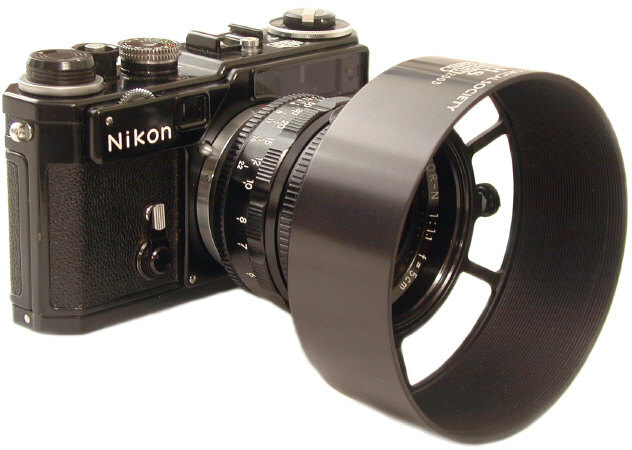 The result is by far the best and most rugged Nikkor 50mm f/1.1 shade ever. 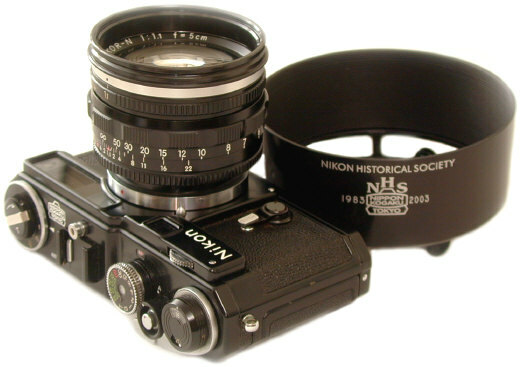 In cooperation with Bob Rotoloni of the Nikon Historical Society, Tom produced a NHS 20 year commemorative shade introduced in the 20th anniversary issue of the Journal of the Nikon Historical Society in March 2003. The shade pictured here is one of 10 pre-production examples. It is differentiated from the production version by virtue of its 20% larger NHS logo and lettering. 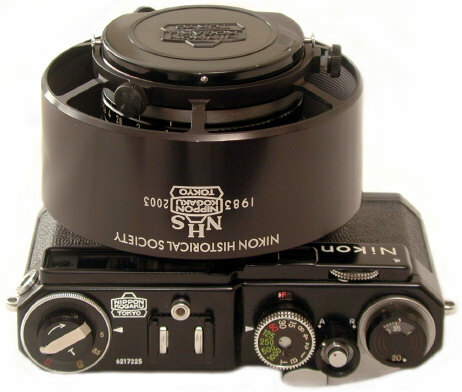 The shade is easily reversed on the lens for carrying, and even mounts the original lens cap. 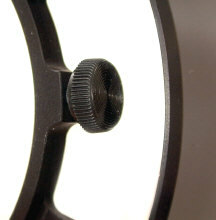 The mounting ring is attached to the lens first, allowing quick mounting and removal of the shade with the set screw. The interior of the shade has MACHINED grooves, the Rolls Royce of lens shades. Unlike the original shade, this new heavy duty shade can probably be safely dropped on concrete without any functional damage, except perhaps to the concrete. 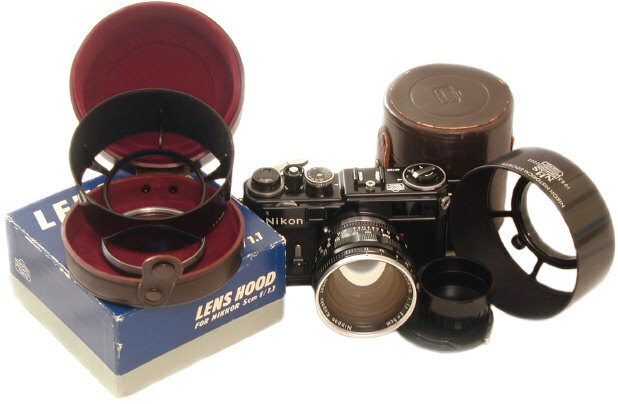 Original Nikon 50mm f/1.1 plastic hood, case, box, Nikkor 50mm f/1.1 external mounted on Shintaro painted Nikon SP, 1.1 lens case, caps, and the new Abrahamsson 50mm f/1.1 NHS hood. Revised: September 12, 2017 . Copyright © 2005-13 Stephen Gandy. All rights reserved. This means you may NOT copy and re-use the text or the pictures in ANY other internet or printed publication of ANY kind. Information in this document is subject to change without notice. Other products and companies referred to herein are trademarks or registered trademarks of their respective companies or mark holders.